A look at factors that explain wage inequality – including classical economic theory and labour market imperfections. Readers Question: Idealized free market theory argues that it is automatic for each worker to receive just what he or she is worth; otherwise, an “underpaid” worker could just look elsewhere to bid a higher salary. Could established theories of the limitations of the free market – unfulfilled requirements and lack of competition – help explain wage inequality? Thus a highly skilled worker will be able to command a high wage due to high MRP and inelastic supply. A worker with limited skills will gain a lower wage. However, in the real world, these wage inequalities can be magnified by labour market imperfections, such as monopsony, poor information and geographical immobilities. Skills / qualifications. One of the most important factors is the relevant skills and qualifications a worker has. If you are a qualified lawyer, then you will be able to command a higher wage. Firms have a limited choice because the number of qualified lawyers is quite limited. 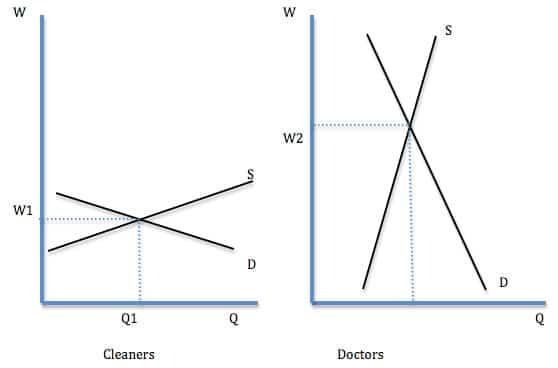 For jobs with limited skills requirements, supply will be more elastic and this will keep wages low. The decline in relatively high paid unskilled manual labour. In the post-war period, in the UK, there were relatively high paid jobs in manual labour, e.g. printing, shipbuilding. But, in recent decades, the UK has seen a decline in manufacturing and a decline in full-time manual labour. This is one group of workers who have suffered from changes in labour markets. 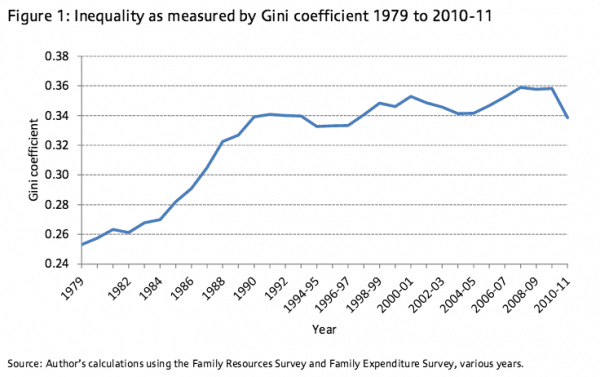 Unskilled work has seen low wage growth and this has increased wage inequality. There has been a growth in demand for highly educated workers. 2. Marginal revenue product for labour (MRP). Another factor in classical wage theory is the MRP of workers. Workers with higher productivity should gain higher wages. Everything else being equal, if a worker has a higher productivity, (e.g. 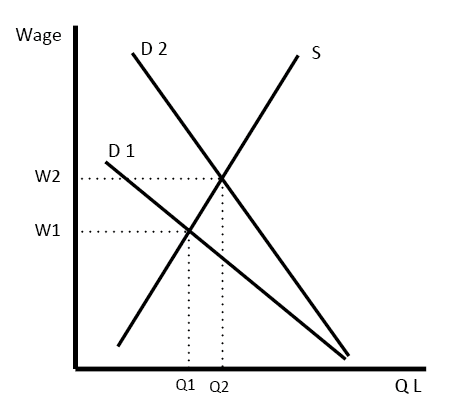 D2) then the worker can command a higher wage. 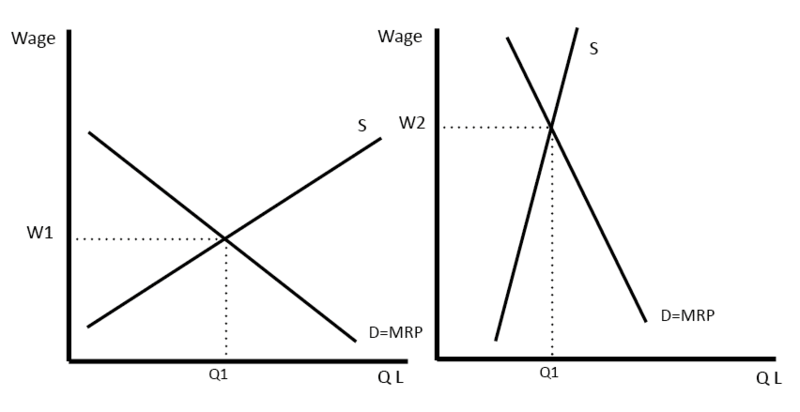 To what extent does MRP theory determine wages? Labour markets are flexible, e.g. it is easy for workers to move job and take a higher paid job. There is perfect information, e.g. a worker will be aware that another firm is willing to pay an extra £1 an hour. It assumes MRP is measurable, e.g. measure how much a worker produces per hour. 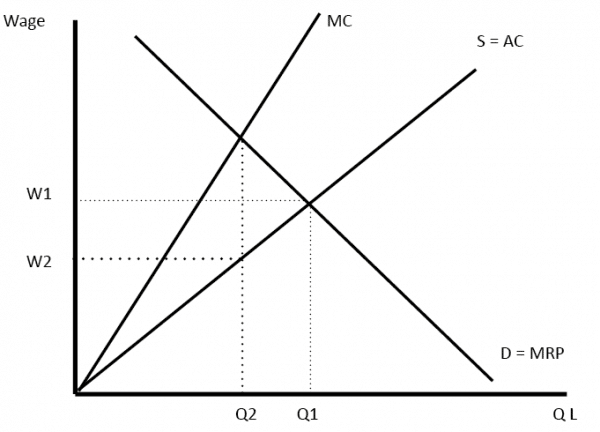 The theory of monopsony suggests employers will have market power in determining wages and therefore are able to pay workers less than their MRP. A traditional monopsony would be a single employer of workers in a town, e.g. steel mill owner or coal mine owner. With no other choice of work, workers have to accept the conditions and wages of the monopsony employer. In a modern economy, these single employers are quite rare, but arguably many firms have significant monopsony power and have market power in setting wages. Unemployment. When unemployment is high, arguably firms gain more monopsony power. Someone who has unsuccessfully applied for many jobs is more willing to accept lower wages to get a job. Geographical immobility. Often work is chosen on grounds of geographical proximity or other non-wage factors (rather than wage rates). Therefore, even if higher paid work may be available elsewhere, it is not worth the extra commute. Difficulties in moving jobs. Workers often have a great reluctance to leave work. You can’t just change jobs like deciding to buy a different type of petrol. A worker will lose on the job training, and firms are reluctant to employ workers who have a habit of moving frequently to get slightly higher pay. Workers can also gain loyalty to a particular place of work, e.g. become friends with co-workers. In recent years, we have seen growth in part-time/temporary work. Work that is often lower paid. Part-time workers have few labour market rights and it is relatively easy for firms to fill in vacancies with workers looking for flexible conditions. If a part-time worker tried to bargain for higher wages, it would likely fail. Employers with part-time and temporary work arguably gain a degree of monopsony power because workers have limited ability to bargain for higher wages; they are easily replaceable. When examining wage inequality, we often compare hourly wage rates e.g. £8 an hour versus £22 an hour. But, an important factor is how many hours a worker is able to work. For example, if you have a guaranteed 40 hour week, you will get a certain weekly wage. 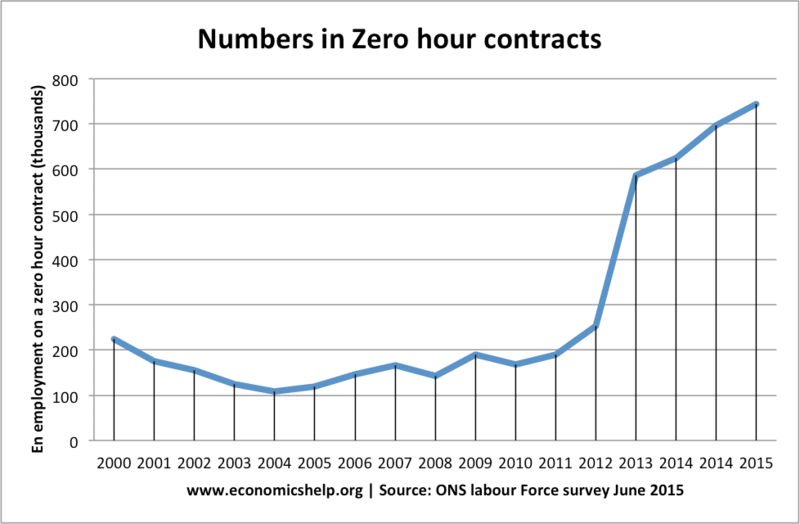 However, if you are on a zero-hour contract, the firm has no obligation to employ for a minimum number of hours. Some weeks, you may only get a limited amount of hours to work, leading to lower weekly take-home pay. The growth of part-time and short-term contracts has led to lower gross weekly pay for many workers and is an important source of wage inequality. Another potential source of wage inequality is discrimination, e.g. women gaining lower hourly pay due to the perceived difference in ability. In theory, wage discrimination is outlawed, though it may manifest itself in other forms, such as some types of workers getting few opportunities to be promoted to higher pay scales. See more on Labour market discrimination. The UK sees substantial wage inequality between different regions, e.g. London sees higher average wages – this is because of greater demand, and relatively shorter supply, due to high living costs. One theory of wage determination suggests that some workers have ‘insider’ privilege and some workers, considered ‘outsiders’ have less. 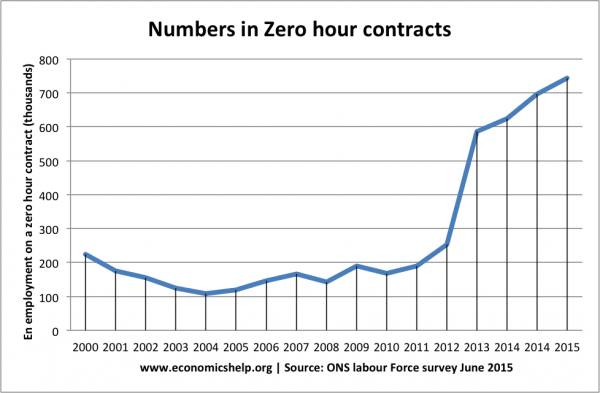 For example, workers employed by agencies on temporary contracts are seen as outsiders and receive low wages. Other workers who have been employed for several years and are considered important to the firm gain preferential wages. Some industries, such as financial services have traditionally been able to make higher profits; this feeds through into higher wages, especially when pay/bonuses are linked to performance. The past couple of decades has seen rapid growth in the net wage of high-income earners; this is partly related to the relative success of financial services. 10. Globalisation/trade liberalisation Trade liberalisation has led to a shift in the structure of the economy. It is cheaper to import labour-intensive goods from emerging economies. This leads to lower demand for unskilled workers in the West. It leads to higher demand for skilled workers in industries with comparative advantage. 11. Inherited privilege With education becoming an important factor in determining lifetime wages, young people from high income / wealthy families tend to have better access to educational opportunities. This can give a help to boosting wages. The biggest growth in wages is from top 1% of earners, and even greater increase in the top 0.1%. One possible reason is that there is a global competition to recruit the highest skilled / highest performers. Increased returns from education. There is more demand for workers with degrees. More students wish to study for longer. Growth in the service sector with more part-time/temporary workers which tend to be lower paid. This gap can be easily reduced by putting forward the issues in the labor union creating collective agreement for the respective industry. Awessssommmmee. Economics help is the best website for Alevels. Loving it!! !